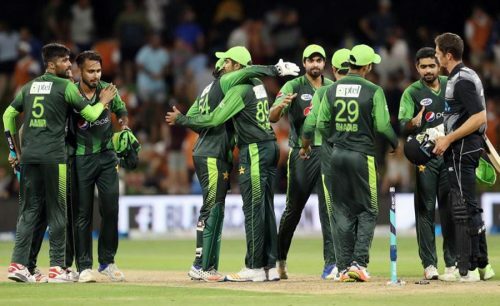 MOUNT MAUNGANUI (Web Desk) – Pakistan laid claim to being the best Twenty20 side in the world Sunday after beating New Zealand in the series-deciding third Twenty20 match in Mount Maunganui. The 18-run victory gave Pakistan a come-from-behind 2-1 series win that will see them overtake New Zealand at the top of the world rankings. Captain Sarfraz Ahmed leapt with delight after the final ball as Pakistan pulled off back-to-back wins over the hosts. Batting first, Pakistan reached 181 for six with Fakhar Zaman making 46 off 36 at the top of the innings. Umar Amin led a late charge that saw 58 runs scored in the final four overs. New Zealand, in reply, were never up with the run chase, and managed 163 for six in their 20 overs. The defeat followed a 48-run loss in the second game, after New Zealand swept the one-day series and won the first T20. The consecutive defeats, following an unbeaten 13-match winning streak across all formats against the West Indies and Pakistan, put a dampener on New Zealand’s preparation for next month’s triangular series with Australia and England. Television replays were inconclusive on whether the ball touched the grass, and after lengthy deliberations the third umpire ruled in favor of the on-field decision. New Zealand managed to arrest Pakistan’s brisk early run rate in the middle of the innings before Amin ensured a competitive total at the end. The 28-year-old left-hander smacked his 21 off the first five balls in an over from Ish Sodhi before the New Zealand spinner claimed the wicket off his final delivery. New Zealand struggled from the start of their reply to get near the required run rate of more than nine an over, and were in early trouble when Faheem Ashraf claimed Kane Williamson for nine. But with his dismissal in the 17th over, New Zealand were 128 for five and their hopes of a miraculous comeback were over.